"This above all, to my own self be true; and it must follow, as night follows day, that I then cannot be false to any man or woman." The basic idea underlying this, is of being true to my own will or who I believe, I really am. Hamlet here is steering Laertes away from the existential doubt, plaguing him at this moment in his life. Hamlet then shares about 'the slings and arrows of outrageous fortune' that oppress him. So what are these 'slings and arrows'? These 'slings and arrows' are falsehoods, deceptions, cheats, lies etc. Hamlet as happens often in life, has been betrayed by those closest to him and is not secure in himself or his relationships with others at this particular time. He advises Laertes about how to be an honest man, to be true to himself, not coerced or manipulated by others into acting against his own real self. Hamlet's argument is that he/she who is true to herself/himself cannot be false. Is it good advice?, that is really up to me and you and the choices we make. If we read the whole extract from where this extract comes, we might say Hamlet is advising Laertes to be average or mediocre. Advising him to stay on the middle ground of life. However there is much passion of the heart in this also, which recommends, the virtue of 'self', as opposed to appearances, shallow people pleasing, while always following the old hierarchy or status quo, with this being essentially a rant against superficiality. Other's have said, that the most valuable thing in life is experience. I believe its good advice but sometimes it is tempered or balanced by the realities of life, with regard to the quality and quantity of life I choose. It is also pitted against the many contradictions of life, best said by another Irishman, Oscar Wilde with, "the truth is rarely pure and never simple." To first know myself, who I am, why I behave, act, speak and react in the way I do. To know my subconscious, sometimes driving me to self-destruct. To know my real self, not just the fake one, to be true to myself without egoism. Much, much, easier said than done.I believe it is good advice, in the sense of when I leave this world, I leave knowing that I have been true to myself and in so doing, have lived the wonderful gift of life to the full. Unlike Bobby Sands, I personally have not always been able to live up to this ideal and have pursued my dark side consistently. Bobby lived just 27 years but in that short time, like candlelight, he held it aloft in that place and time he came from in Ireland, to a world of darkness around him, while at the same time being true to himself and an inspiration for others. I used to give myself a hard time, about not being able to live up to the ideals of Bobby Sands but then I remember another of his sayings; "Everyone, Republican or otherwise has their own particular part to play. No part is too great or too small, no one is too old or too young to do something." Somebody asked me yesterday, how do we follow Bobby in a country, where it is illegal to go out and protest march on the street. I replied from my own experience, that really it has always been so for Irish republicans and socialists and that it never has stopped us. I suggested starting off, by picketing a place that needs to be picketed, using it to educate, agitate and organize and that essentially it is simple process. This takes me back to what I call my own, "Bobby Sands Experience". I was in London,when the first hunger-strike of that time started, which was an extension of several years of the blanket and dirt strike, by Irish political prisoners. I had attended previously the huge funeral of the dead hunger striker Michael Gaughan from Cricklewood to Kilburn. It was an overwhelming, thought provoking, emotional and spiritual experience. At this time I joined a weekly picket in London, with placards about prison conditions in Long Kesh which were dire. We also had a "loud hailer" and handed out leaflets to passers by, explaining as best we could the details of our protest and the prison conditions. We were generally treated well by the public, which was largely immigrant but also the ordinary English working class. The protesters included, Provisional Sinn Fein, the Irish Republican Socialist Party and a significant number of English activists, from the United Troops Out Movement, which included Ken Livingstone and his comrades from that genuine part of Labour which is rare. These people were an inspiration to work alongside with their persistent commitment and hard work for the Cause of Ireland. " The Cause of Ireland is the Cause of Labour and Cause of Labour is the Cause of Ireland." James Connolly. I was regularly taken in for interrogation by the police but generally treated OK. I was totally unprepared for all of this and had as much fear, as the average person but my commitment and belief in the Cause of what I was doing saw me through. I would suggest though for anyone or party who follows, that there is some sort of tutoring or training needed, to prepare comrades for the experience. This is a major weakness in most parties of the left in my not so humble opinion. The harassment of my wife and new born child started at home returning from work one day, to find my wife unconscious and the apartment ransacked for political reasons. On another occasion our new born child remained unattended for hours, while my wife was being interrogated for hours at a police station. We were forced to return to Ireland, as result of this harassment from the police. The back drop to all of this was that we had stayed for several years in the place, where the Guildford Four had been framed or set up for several life sentences, of which they were totally innocent. This injustice and common knowledge of many Irish people and professional legal people in London at this time drove us on. During this time Sean McKenna from outside Newry was on hunger strike along with seven other comrades demanding political status. Originally the 17 year old Sean, like Marian Price today, was interned without trial for three years. His father, Sean Snr. was one of what later became known, as the 14 hooded men, who were tortured and experimented on by the British Army. Sean was kidnapped by the SAS and taken across the border, where he was tortured so severely, that his hair turned from black to white, almost overnight. The British were found guilty by the European Court of Human Rights of torture. After 53 days on hunger strike, Sean Jnr. went into a coma hours away from dying, when IRA leader Brendan Hughes called it off after promises, from the British Government on a compromise. However the agreement was later broken by the British, when the hunger strike was no longer in the public eye. The Blanket and dirt strike were then continued. The reaction to the British breaking their promises was utter rage on the Irish street. I arrived in Newry from the west of Ireland, on the day that bits and pieces of landrovers, helicopters, British lorries and approximately 40 British paratroopers, some of them vapourized, were sent flying through the air at Narrowater outside Newry. The British to this day, claim it was just 18 but like almost every incident in British Occupied Ireland, with the help of the BBC world service, they are still lying. IRA volunteers from South Armagh and South Down were held responsible. day, a certain Admiral of the Fleet - Louis Francis Albert Victor Nicholas Mountbatten, 1st Earl Mountbatten of Burma, KG, GCB, OM, GCSI, GCIE, GCVO, DSO, PC, FRS, Prince Louis of Battenberg, Viceroyal of India - Chief of the Defence Staff, Chairman of the NATO Committee, Queen's cousin Lord Mountbatten was blown to smithereens, sky high, along with his yacht in Mullaghmore. From his birth until 1917, when he and several other British royals dropped their German styles and titles, Lord Mountbatten was known as 'His Serene Highness' Prince Louis of Battenberg. He was the youngest child and the second son of Prince Louis of Battenberg and his wife Princess Victoria of Hesse and by Rhine. His maternal grandparents were Louis IV, Grand Duke of Hesse, and Princess Alice of the United Kingdom, who was a daughter of Queen Victoria and Albert, Prince Consort. His paternal grandparents were Prince Alexander of Hesse and Princess Julia of Battenberg. Whatever about Highness, there was nothing particularly serene about "His Serene Highness" that day in Mullaghmore. For many of those who read the link above it seemed poetic justice, as it seemed to me at that time. Unfortunately there were innocents victims and while technically in military terms it may have been "a good job," it did not advance the Cause of Ireland or justice one iota. Settled down in Newry I was horrified to see that the Republican struggle, had deteriorated into a shambles of dis-organization and demoralization. Unlike London there was little visible solidarity, with regard to the blanket and dirt protest. Other than a few stalwarts like Tom Lonergan and local traditional Protestant republicans, there was demoralization after the failed hunger strikes and muddled IRA truces and ceasefires. Then the lead up to the Hunger strike led By Bobby Sands, was prioritized. Initially I could only muster a few young lads who were classed as "outcasts" by the broad republican movement at that time. Just the few of us picketed outside the SDLP civil rights, Rory McShane's solicitors offices, on the main Hill Street of Newry. Not many paid us a blind bit of heed, while the well heeled, elected, suited, SDLP electioneers like Provisonal Sinn Fein of today, scoffed at our poor, scruffy small protests. These young lads were of Bobby Sands age. As the protest around the Hunger Strike progressed, the crowds came eventually. We walked the streets of Newry in night time vigils shouting Gerry Fitt is a Brit and called for political status. We walked the roads of South Armagh and blocked the border outside Newry in protests. We marched to Dublin to carrying the message through the Free State towns along the way. The stickies including the current Irish Foreign minister, from initially trying to stop the protests, with some bad beatings in the backs of vans to young lads, like the current protests initially on Marian Price's internment, started to fight among themselves, as the Hunger strike progressed. On the 5th of May 1981 Bobby Sands died after 66 days on Hunger Strike. All changed, utterly changed as WB Yeats said of the 1916 rising. We were initially stunned. Many wanted to riot wholesale but the leadership in Newry at wisely at that time prevented msot of it.This leadership now consisted of the local branch of the H-Block and Armagh Committee, made up largely of the IRSP, some independent human rights and political activists and just a few Provos. Both the Official and Provisional IRA were badly split at this time in Newry. After Bobby Sands' death, with the help of Danny Morrison, ethical elements of all three "citizen armies" came together, to unleash a military campaign of utter rage on the local British war machine. an apt name for the fury, the British triggered with Thatcher's treatment of local man Raymond McCreesh who died on hungerstrike. The list reads as follows. My lessons from this experience are that Bobby Sands was on the right track but that a hunger strike is terrible price for a young man or woman to pay, because the gift of life is so precious. I feel particularly for the mothers, fathers, wives, daughters, sons and families of the hunger strikers, as I do, for the loss of all families Irish and overseas associated with what is called the troubles in Ireland. The whole experience has taught me that violence is not the way forward at this time in Ireland. When the clear majority of the island of Ireland demand a revolution to effect change and that is demonstrated clearly on the streets of Ireland, only then can this revolution be considered and effected. Our task as revolutionaries in the meantime, like those young outcasts on the streets of Newry, inspired by Bobby Sands are the cutting edge of change. Bobby Sands was a prolific writer.The written legacy of this young working class lad, inspired me to believe, that perhaps the pen can be mightier than the sword. That we do not have to be great writers to make it happen, that a sufficient number of us committed to this exercise, despite censorship, cannot be ignored. The 'Truth' can set us free, it is always our friend in the long run. It is the friend of Ireland in the long run. Our enemies will always try to provoke reactionary violence, to discredit and as excuse to intern us and continue to use their death squads. We don't need this. The cause of Ireland and the history of our struggle is a just and noble one. We do not need reactionary violence to assert our cause albeit we do need a considerable amount of patience. I perosnally do not agree with how the 'Peace Process" happened but now that it is an approximate reality, I believe, it is the best environment to take Ireland's Cause forward, without becoming part of the establishment politics of revisionism or mere reformism. It needs the input of 'the people of no property' to keep it honest, to prevent it falling into the hands of the middle class like Fianna Fail. It is our responsibility to keep those who live and profit off other men and women's wounds, honest. There is much material around this time and experience too painful for me to write about further, at this time. There is also much around my own failures and mistakes in making Bobby and his comrades dream a reality that has been humbling. I have stopped beating myself up about this, there is no future in that. Irish republicans who continue to inspire me, have a humility about them, that is neither servile or egotistical. I will also add from bitter personal experience, that revolutionary politics and heavy drinking do not mix. I could tell you that I became disillusioned with revolutionary Ireland and became an alcoholic drinker ore Vice Versa but that would be a too simplistic. It is far more complex than that and would take more than a few pages to explain, besides I do have responsibilities to other people. It saddens me however to see an excess of finger pointing, rather than honest self-appraisal around the republican movement. I have been guilty of my fair share of it, I need to remind myself it time to stop, I do not build up my perspective by putting other down but we are human. There is no future in this and it is totally unjust to point a finger at any other Irish republican, unless you have walked in their shoes. Perhaps at best, we have the dubious luxury of being be judged by their peers. It is time in the interests of unity and sticking together, to forgive without forgetting the many lessons and to move on to another phase of the struggle, which will be equally tough and requires solidarity. Blackmail by the British Secret services, after such a long struggle is far more extensive, than the Movement cares to admit. It needs to addressed in a thorough manner for Ireland's sake. Pickets, street protests, campaigns of civil disobedience and dare i say that oh so painful word that is so heart breaking, hunger strike are the way forward in the shadow of the 9/11 and 7/7 narratives. The British are recruiting the Americans and the world to their side with it. 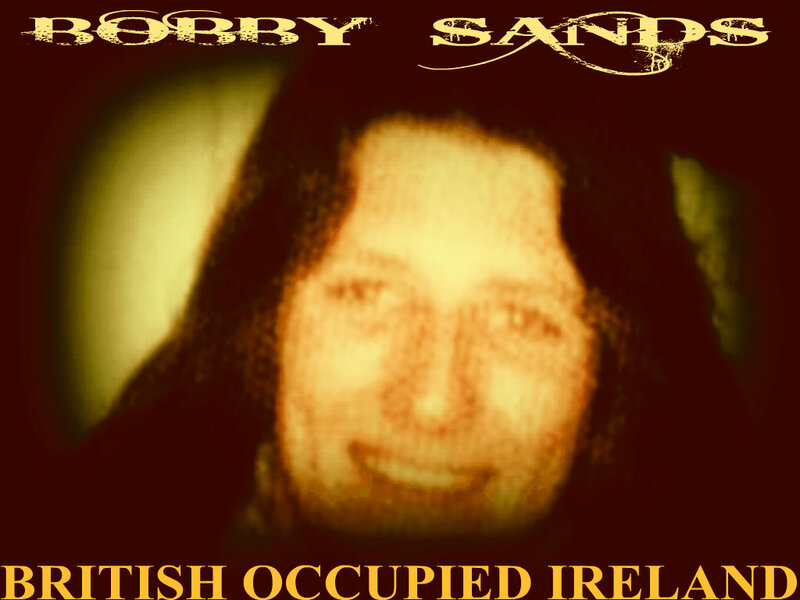 the current treatment by the British Tory establishment, of Marian Price and Martin Corey are anything to go by Bobby Sands and his comrades are not the last.